If you’re someone who likes to do carpentry, woodwork, or even just DIY projects, you might have had to saw your own wood. Make that job easier by getting a couple of saw horses to hold up your planks! Let’s check out the best sawhorse that will fit your needs today. It includes two detachable bar clamps. The sawhorses have an anti-slip surface. It includes four sawbucks that can support a 2x4 plank. All-steel construction means it’ll support itself well and will last longer. It has a clamp that’s 10 times stronger than a regular vise to keep your wood in place. What is a sawhorse and do I need one? What kind of sawhorse should I get? The WORX Clamping Sawhorse Pair is our editor’s pick. It already comes as a pair, and when used together, they support up to 1,000 lbs. There’s no need to worry about it breaking under pressure. Made out of thermoplastic polymer, it’s designed to be durable and at the same time, lightweight and portable. It’s foldable for easier storage, too! This sawhorse also includes two bar clamps which you can use either vertically or horizontally depending on your project. It can support up to 1,000 lbs. when both saw horses are used together. Thermoplastic polymer material makes it durable without making it bulky. It’s foldable so you can put it away easily after using it. It also has a built-in shelf and cord hooks so you can easily store tools and other materials. There are two detachable bar clamps which you can use in either direction to fit your needs. It already comes in a pair for your purchasing convenience. It has a tendency to tip over since the base is too narrow. It is not really ideal for heavy projects due to its lightweight nature. For our runner-up contender, the Goplus Sawhorse Pair takes this spot due to its sturdiness and reliability. 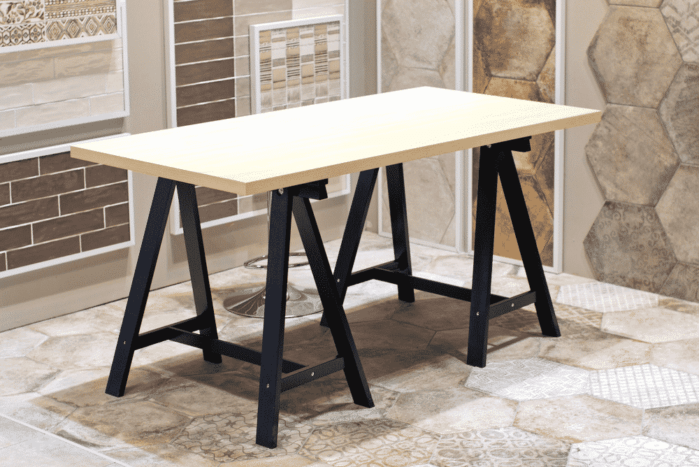 With its heavy-duty metal legs and anti-slip work surface, you can work without worrying about your piece falling off. Just like the WORX sawhorse, the Goplus sawhorse can also be folded for convenient storage. It also has a sturdy handle for easier transportation. What’s also good about this is that it already comes fully assembled so you can get straight to work. It’s made out of metal which makes it durable and sturdy. It’s portable and easy to store. Fully assembled right out of the box. Anti-slip rubber surface adds to the overall stability when you use the sawhorse. When both sawhorses are used, the weight capacity is only 500 lbs. which is lower than what other sawhorses offer. Since it’s made out of metal, it’s a bit heavy. Our budget pick is the Hitachi 115445 Heavy Duty Folding Sawhorse. Despite it being a budget pick, though, you still get two sawhorses in one purchase. It’s very convenient because you don’t have to buy them separately. This is the leading sawhorse when it comes to weight capacity. If you use both sawhorses simultaneously, the weight capacity would be 1,200 lbs. Aside from this, the sawhorses also come with four sawbucks. Talk about a great deal! It leads to weight capacity of 1,200 lbs. compared to other sawhorses. Four sawbucks are included; the sawbucks can hold a 2x4 piece flat on its side. It has hooks on the side for you to hang your materials or your tools’ cords. It also has a built-in shelf so everything’s within reach while you work. It’s collapsible, too, so it’s easy to store. It’s made out of hard plastic, unlike other sawhorses that are sturdier due to their steel construction. It does not come with instructions on how to use the sawbucks. The Portamate All-Steel Folding Sawhorse is a great option for those who have a little bit more money to spare. 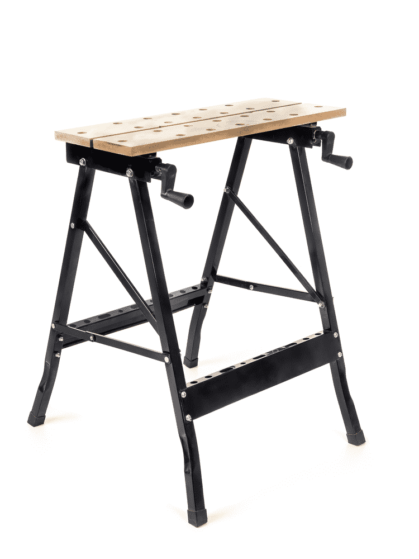 What makes this sawhorse a bit pricier is that it’s all-steel, however it’s totally worth it. This means that with a bit of investment, you’ll have sawhorses to last a lifetime. Just like the products above, this also comes in a pair when you buy it. When used together, they can support up to 1,000 lbs. They also come fully assembled so there’s no need for you to bother with odds and ends when it arrives. It’s collapsible so you can put it away easily after use. All-steel construction means it’s sturdy and will last longer. The tops are pre-drilled and can support a 2x4 or 2x6 wood cutting surface if you have one. The bright orange paint may peel off. Since it’s made out of steel, it’s susceptible to rusting. Rockwell’s RK9002 JawHorse Sheetmaster Portable Workstation is our niche pick for today. What makes this so special is that it’s multipurpose and it’s powerful, too. It’s a sawhorse with a clamp to keep your workpieces in place. It also has a switch to lock whatever you’re clamping onto the sawhorse to ensure that your pieces do not move. You can also clamp some plywood on it and turn it into a workbench. After using, it’s easy to fold this down for storage. It’s also has front wheels for transportation. Has a hands-free clamping power of up to 1 ton of force. Easily foldable for convenient storage after use. Front wheels can help you move the sawhorse around faster and more efficiently. Steel material and tripod-style construction make it extremely sturdy and reliable for various projects. It does not come in pairs, unlike other sawhorses. Individually, it can only hold 600 lbs. It’s on the pricier side of the spectrum in comparison with other sawhorses. A sawhorse is a tool that helps you hold up wood that you’re about to cut. It has a surface with A-frame legs on each side. They’re typically used in pairs. Sawhorses are typically portable. Because of this, you can also create a makeshift workbench with plywood and a pair of sawhorses. You can also create a scaffold out of a pair of sturdy sawhorses and plywood. It will allow you to reach higher in case a ladder isn’t available. Do you need one? It’s definitely a good addition to your workstation if you’re serious about woodwork or construction. Nowadays, most sawhorses are easily portable and collapsible anyway so space isn’t much of an issue anymore. They’ve also added lots of convenient features onto sawhorses. If you’re someone who likes to work at different places, portability might be important for you. Some sawhorses now have shelves and hooks built onto them. This makes it easier to take your work elsewhere. Nowadays, commercially sold sawhorses are typically made out of either hard plastic or steel. If you’re on a budget, hard plastic sawhorses are the way to go. However, they tend to be less durable than their steel counterparts. If your projects look like they need heavy duty sawhorses, it’s best that you make an investment right away. This is better than buying a cheaper, plastic sawhorse to save some cash only for it to break mid-way. However, if you’re not planning on working on heavy projects, it’s fine to buy a lightweight sawhorse. This will let you save some money and let you spend on other parts of your project. The first thing you’ll probably see when you’re looking for sawhorses is the weight capacity. If you know how much weight capacity you need that makes choosing easier. If not, it’s best to pick the biggest weight capacity possible to cover any and all possible projects. Also, keep in mind that companies usually sell sawhorses in pairs. Therefore, the weight capacity they list usually reflects the capacity for when it’s used as a pair. This is convenient because you don’t have to make separate purchases. Aside from providing a sturdy surface for your plywoods, some sawhorses have added features too. Some sawhorses come with clamps, sawbucks, hooks, built-in shelves, and more. Choose the features that you think would make your construction life easier. Make a workbench out of your sawhorse. Place some plywood on top of two sawhorses and use it as a makeshift workbench. This is good if you like to work at different locations. If your sawhorse doesn’t have a built-in shelf, it’s helpful to make a makeshift one, too. Just place a plank across the cross braces. Now everything is within reach. Use your sawhorse as a drying rack. If you need to dry those long planks of wood that you just painted, a sawhorse can do the trick. These are only a few of the possible extra uses you can get out of a sawhorse! So don’t worry if you’re only planning to use it for its intended purpose once. Sawhorses are extremely versatile and are definitely worth keeping around. In conclusion, sawhorses definitely deserve a spot in your shed. Nowadays, sawhorse manufacturers have gotten way more innovative. It’s not just about placing things on top of them anymore. There are plenty of other possible uses for it, as well. Sawhorses are a good investment to make if you’re serious about DIY or construction. You’ll find that it’s something that pays itself off in the long run. So what are you waiting for? Get a sawhorse today! With the convenience it offers, we’re sure you won’t regret it. If you’re into value for money, we think the WORX Clamping Sawhorse Pair WX065 is a great pick. It has an impressive high weight capacity, moderately priced, and comes with a clamp. It also has built-in shelves and hooks so it’s super handy especially when you’re outside. Aside from that, it’s also lightweight and easy to store. Space isn’t a problem since you can easily fold them up and store them elsewhere. They also don’t weigh too much so if you have overhead space it’s not hard to lift them up. If you’re looking for something more heavy duty, though, the Portamate ones are a good choice. If your budget allows, you can even look into getting a pair of the Rockwell JawHorses. We hope you find a great sawhorse that fits your needs! If you liked this article, please don’t forget to let us know by commenting below. You can also share this article with your friends if you found it to be very helpful. Thank you!